Sat., Feb. 24, 2018, 6:48 p.m.
SALEM – Meth-related deaths are higher now than they’ve ever been in Oregon, far surpassing the rates seen at the height of the meth crisis in the mid-2000s. In 2016, methamphetamine contributed to more deaths than heroin and effectively matched the death rate from prescription opioids. Experts disagree on why deaths are higher: Some say use is up, others point to an increase in the product’s potency and purity. Others posit that those deaths could be a ripple effect from the state’s opioid problem. And there are some who say deaths actually aren’t rising, there is just more attention being paid to overdoses now. But the numbers have caught the eye of the Oregon Health Authority. Matt Laidler, lead research analyst with the OHA, speculates deaths are actually rising. In the coming months, he will be digging into the underlying death certificates and investigation reports. “Answers are fairly sparse at this point,” Laidler said. Deaths have steadily risen since 2012, when there were 51 overdose deaths from methamphetamine, according to the OHA, which derived the data from death certificates. In 2016, those deaths hit 141. Over that same time frame, heroin deaths dropped from 124 to 107 and pharmaceutical and synthetic opioid overdoses fell from 174 to 149. Drug-related deaths reported from the medical examiner’s office arrive at slightly different conclusions, yet show a similar trend. It reports that in 2016 there were 232 meth-related deaths and 124 heroin-related deaths; in 2012, those numbers were 93 and 147, respectively. The reason for the discrepancy is the subjective nature of determining what constitutes a “meth-related” death. The investigation takes into account what drugs were in an individual’s system and circumstances surrounding their death. This subjectiveness adds another layer of uncertainty to an already complicated problem. How did oregon’s pseudoephedrine law affect meth labs? State Medical Examiner Dr. Karen Gunson said the 2004 Oregon law requiring pseudoephedrine to be placed behind pharmacy counters was a watershed moment for meth-related deaths. In her 32 years with the medical examiner’s office, she has watched the number of people dying from methamphetamine use change. She would see meth-related deaths “day after day” before identification was required to purchase pseudoephedrine – the critical ingredient used by meth labs. Salem Police Lt. Dave Okada remembers the effect of meth on the community when Marion County was designated a high-intensity drug trafficking area around 2000. “It was the heart of the methamphetamine epidemic,” Okada said. “When I was working with the (drug) task force, we were finding superlabs everywhere,” referring to clandestine operations capable of producing large quantities of meth. In 2003, one year before the Oregon Board of Pharmacy adopted a rule requiring pseudoephedrine products (other than certain liquids and gel caps) be kept behind pharmacy counters, Oregon State Police reported 473 meth lab cases. In the first seven months after the rule took effect Nov. 15, 2004, there were 166 meth lab cases, roughly an average of 24 a month. In 2004, Oregon State Police recorded 448 meth lab cases. On April 6, 2005, the pharmacy board adopted the pseudoephedrine rule, which also included requiring picture identification for a buyer and logging each transaction. In 2005, Oregon State Police recorded 192 meth lab incidents. On April 5, 2006, the board adopted a rule requiring a prescription for all pseudoephedrine products. In 2006, Oregon State Police recorded only 63 meth lab busts. Oregon has seen a roughly 97 percent decrease in meth lab incidents since pseudoephedrine products were restricted to prescription-only availability, according to Oregon State Police. How are heroin and meth use related? When meth essentially disappeared from Oregon streets, drug users chased the need to satisfy their high with heroin. Okada said heroin was easier to purchase but users soon turned to prescription medications like oxycodone. The opiate is typically prescribed to treat pain. “Heroin was becoming more prominent and at one point coinciding with the prescription medication and oxy trend,” Okada said. Chris Gibson, the executive director of the Oregon-Idaho High-Intensity Drug Trafficking Area, said the rise in heroin use can be explained by prescription opioid users who transitioned to heroin because it’s cheaper, easily available and provides a more intense high. Oregon health and law enforcement officials have since shifted their focus to opioid treatment on the heels of Gov. Kate Brown’s recent opioid epidemic designation, but methamphetamine deaths have quietly and steadily increased over the past few years. Members of the Public Safety Coordinating Council examined several recent developments in their respective fields in early January, including health officials’ growing focus on Oregon Medical Board recommendations to prescribe fewer opioid pills and shift toward alternative treatments. How are meth and crime related in oregon? Oregon public safety and law enforcement officials say meth is making a comeback – and it’s affecting crime. Okada points to increased property crime in Salem, which he said is directly correlated with people trying to steal property to raise money for drugs, including both methamphetamine or opioids. While meth lab drug busts have decreased since 2004, Oregon law enforcement agencies are still knocking down methamphetamine distribution operations. In October, three Hubbard men were arrested in a drug bust where police seized more than 76 pounds of meth, more than $50,000 in cash and handguns. Three Salem men were also arrested on suspicion of trafficking heroin, methamphetamine and cocaine in October, where Drug Enforcement Administration agents found 18 pounds of meth packages and drug ledgers. Over the past decade, meth-related convictions also have steadily increased, according to the Oregon Criminal Justice Commission. The commission administers the state’s felony sentencing guidelines, funds and evaluates the state’s drug courts and conducts research on Oregon conviction and recidivism rates. Sentencing data compiled from 2008 to 2016 shows a consistent growth in meth possession convictions followed by meth delivery convictions, according to Kelly Officer, a senior research analyst with the justice commission. In 2008, the commission recorded 2005 incidents of meth possession convictions. That number soared to just under 3000 in 2013 with 2885 convictions. By 2014, there were 3615 incidents of meth possession convictions. Meth possession convictions saw a boost in 2015 with 3665 convictions and slightly decreased to 3612 convictions in 2016. Data for 2017 is not available. 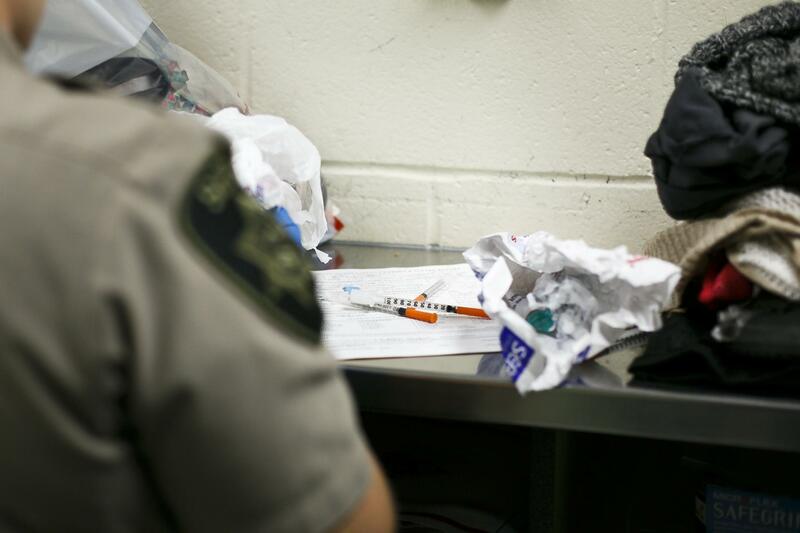 Oregon law enforcement agencies are trying to curb drug use by focusing more on treatment options, especially with the use of drug courts, which target nonviolent high-risk offenders who have substance abuse disorders. The courts were created in an effort to reduce recidivism, according to the commission. Okada acknowledged Oregon law enforcement agencies and public safety agencies are working together to tackle drug crime and drug-related deaths, but said it’s going to take a cohesive effort like the “No meth in my neighborhood” campaign used in the early 2000s to curb meth use, in order to make a dent. The campaign was a community-wide effort including public education of the signs of drug activity, signs of addiction and prevention efforts. Published: Feb. 24, 2018, 6:48 p.m.